Preface: As I mentioned in the tips, we had contacted all of the chefs and we were feeling pretty confident about our dining options for table service, but we couldn’t predict counter service. Eating at these places took a lot of asking/leaving other places in the parts. The only ones that knew we were coming from counter service were at our resort. One thing to note: we did have the Dining Plan this year; we got it as a PIN a few months before the trip. We were out for a walk on our second day so opted for dinner at Riverside Mill instead of our home base (we were staying at French Quarter, and knew we’d eat there eventually). I wanted to have Counter Service since it was the night before the race, and wanted to eat early, simple, and bland (sometimes my celiac disease and other issues aren’t on their best behavior). Plus, I’m okay with simple and bland (you might notice this). Our Chef was Molly, and she was super amazing and friendly. I was being super particular with what to include in my dish (given the race) and she totally understood (and I told her about the race, as well). 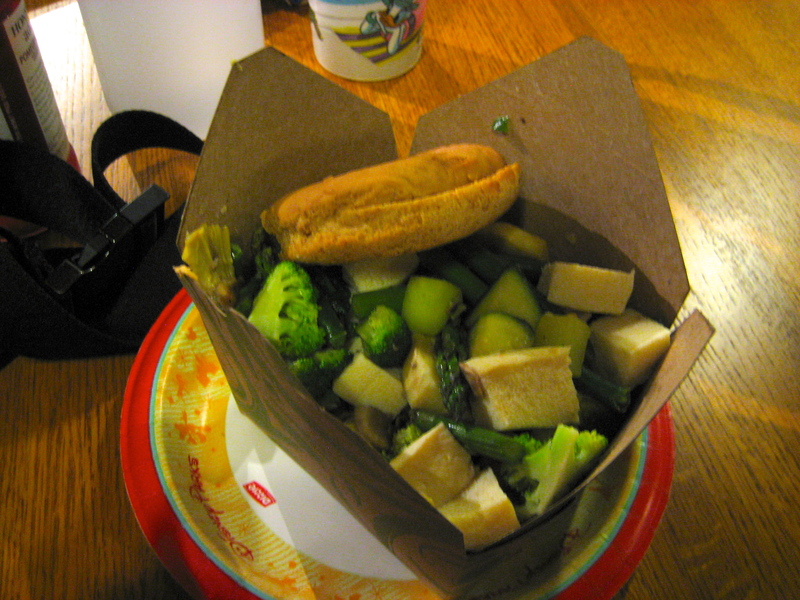 At my request, she made me a quick fry-up with tofu and veggies (basically the ones that are available in the salad bar: zucchini, summer squash, asparagus, artichokes, greens, and mushrooms). I had an Honest Ade Pomegranate Blue with it, an orange, and a GNI bun. Mom had the same, but with chicken instead of tofu, and a V8 instead of the Honest Ade. 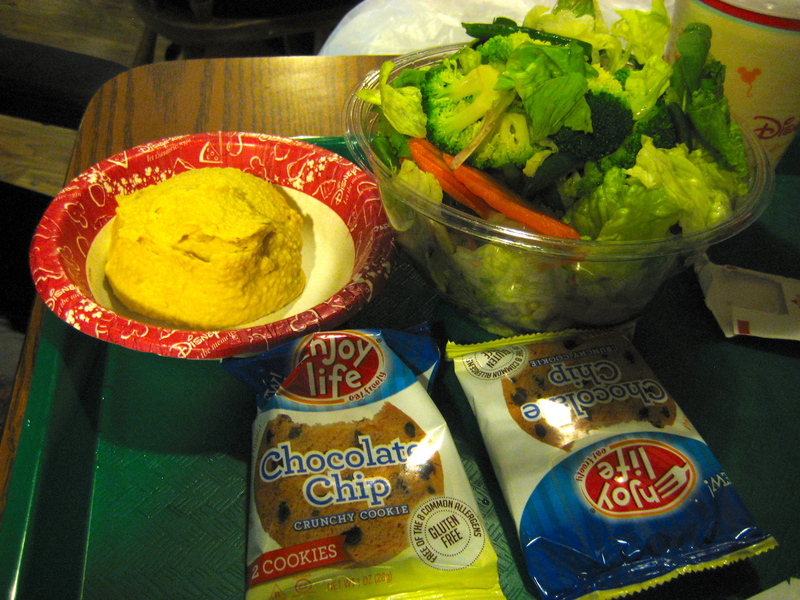 We had Enjoy Life Chocolate Chip Cookies (the crunchy ones… I miss those soft ones, but they changed them out). We ate quickly and I had an early bedtime, so this is clearly a boring day! But Chef Molly was awesome and accommodating and really, probably anything I asked for she would have done. We figured we’d have a pretty good shot of eating something a little more unique at Landscape of Flavors–plus, we wanted to check out Art of Animation to see if it was somewhere we’d eventually want to say (spoiler: no). It was the night of the race and I didn’t feel too well — I just wanted to have something quick and get back to the room. We hadn’t booked a reservation because we have a tradition post-race of going to Beaches and Cream, and then seeing a movie, and we didn’t want to be tied to a time. We figured this would be a nice day to explore (it was). The chef was really friendly and accommodating here, though I am not sure why, but didn’t scratch down his name (which is odd for me!). 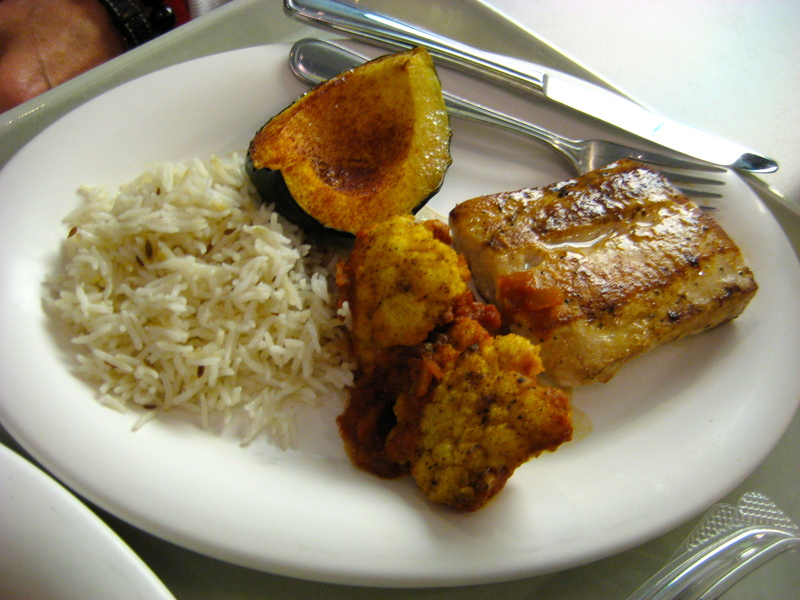 We mixed and matched different things: Mom had the mahi mahi filet with a side of acorn squash and cauliflower with tomatoes and basmati rice. It was pretty good, she said, though the fish was really well done (meaning cooked well, not overcooked). 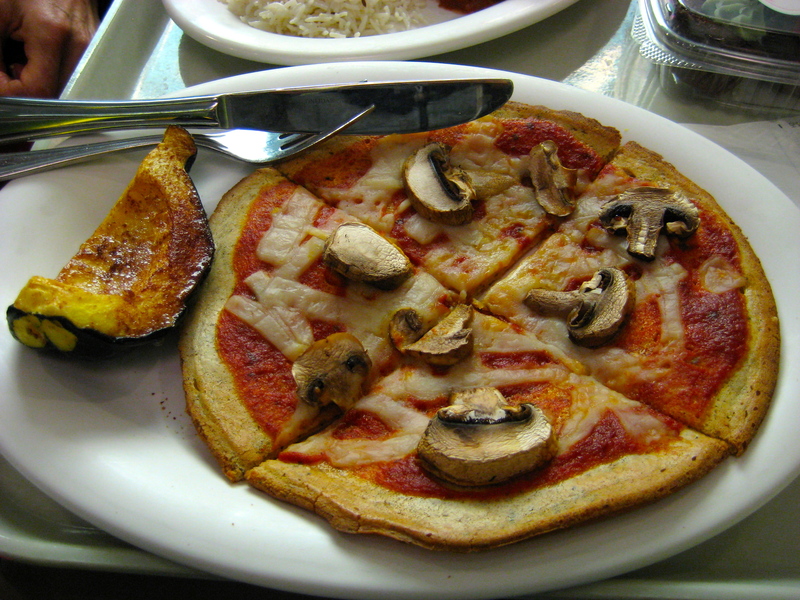 I had heard in advance that the GNI pizza crusts were NOT egg-free. It said so on the label, but the company itself had told me only their rolls were safe. I trusted the label (especially since it wasn’t gluten or dairy, which I wouldn’t have bargained with, EVER). I assumed it was going to be Daiya as the topping (since that is the general Disney cheese topping), but it was Tofutti (another thing I never eat). I ate the meal but it made me really uncomfortable, and I didn’t feel great after. That being said, it might have been mind over matter and/or the fact that I was super dehydrated from the race and the long day. Following up with GNI post-trip, it turns out everything was mislabeled. Then I received another email saying they were safe. So… I have no idea. But with so much discrepancy combined with the fact that, generally, their products do contain eggs, this, I felt, was really weak. What if I was anaphylactic to eggs? I would never take a chance, say, with my child’s health. This, of course, was no fault of the chef. They read the labels, the labels say gluten, dairy, egg, and soy-free. I had the squash as a side and was still ravenous after. 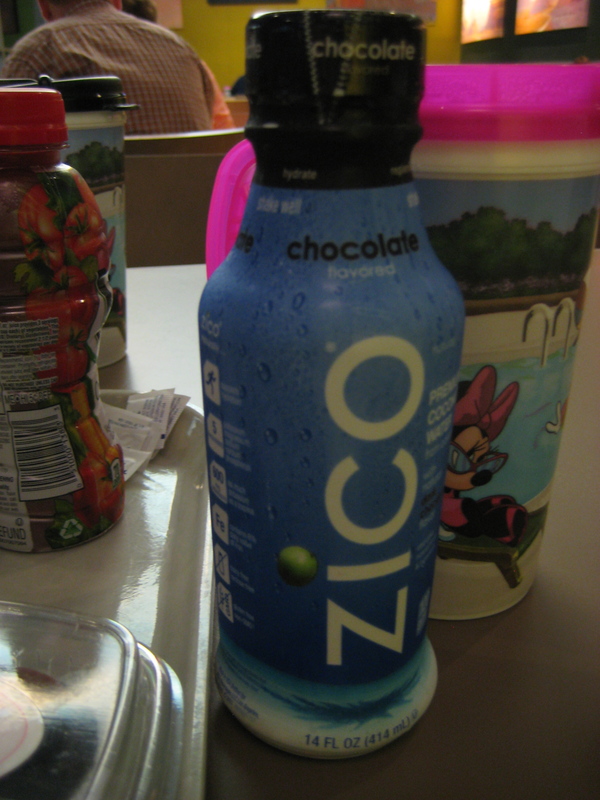 They stocked coconut water (Zico) in the fridges there, so I got one of those to help with the dehydration. Mom had a V8. For a brand new resort with such a fabulous, eclectic offering, I thought this was pretty weak, to be honest. 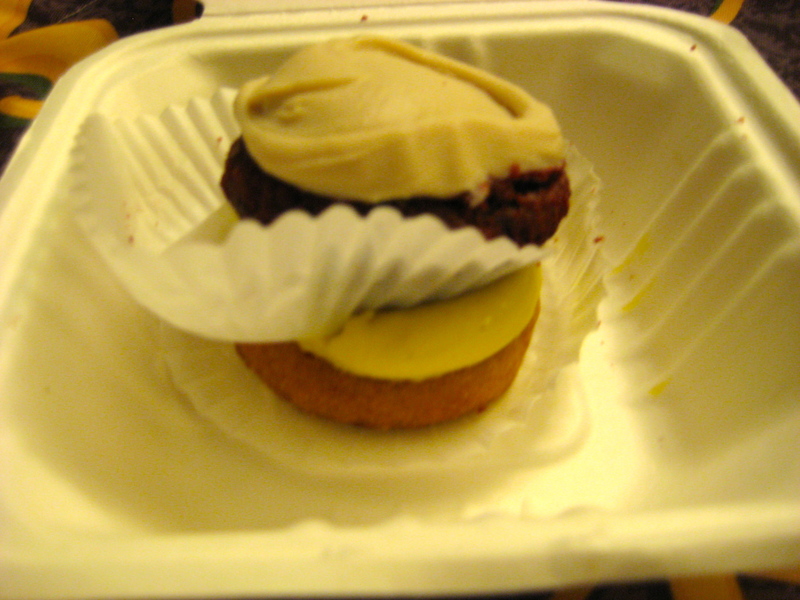 Dessert for Mom was Babycakes: four brownies (not mini cupcakes) with their frosting. I chose Surf Sweets gummies as a dessert–a weakness of mine! I love gummy anything, and they often have gelatin, and I do really like Surf Sweets, too. 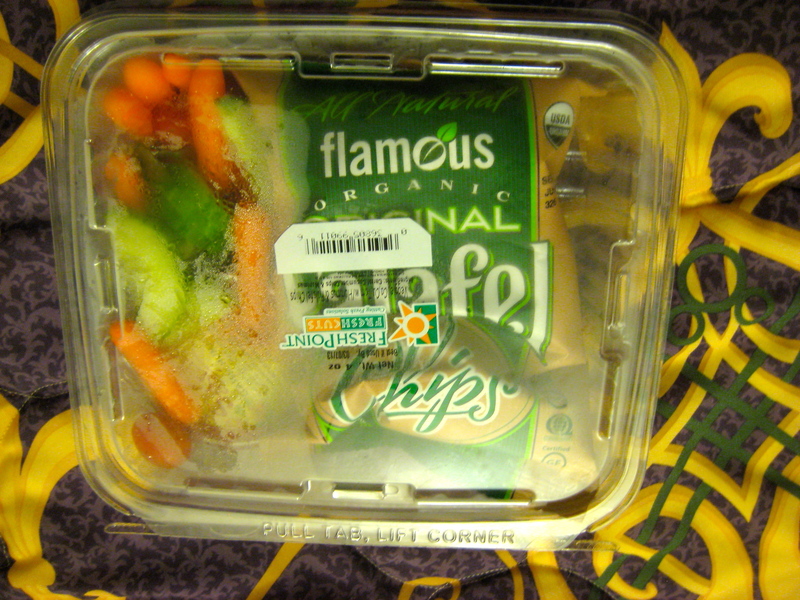 It consisted of a bag of gluten, dairy, egg, soy-free Falafel chips, cut veggies, and Sabra hummus. Mom couldn’t have the hummus (it has soy), but we had an extra credit to use up and it made up for a good light lunch. Sassagoula is homebase for us at French Quarter, and we generally eat at Table Service for dinner, but brunch the day after the race is always Boma… so tonight we changed it up. 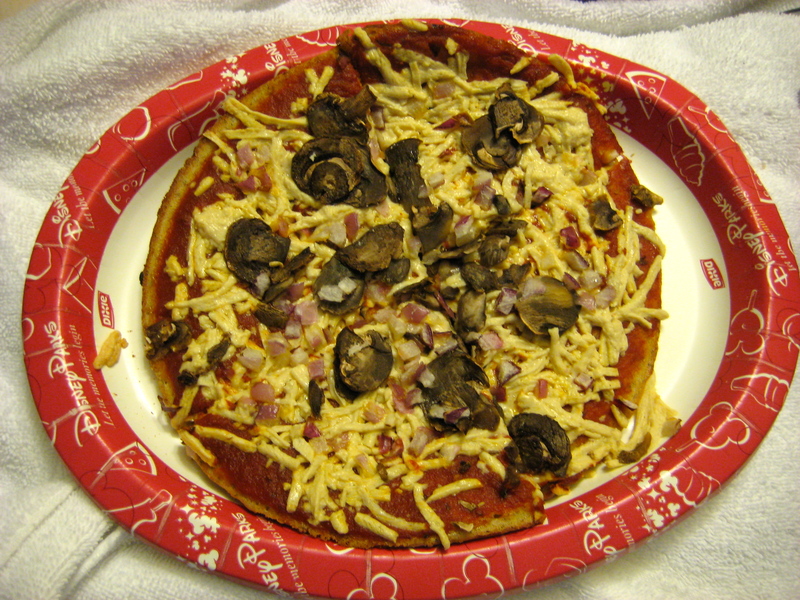 Still not knowing about that whole pizza debacle, Mom had a GNI pizza crust with Daiya, Amy’s Marinara, mushrooms, and onions, with a side salad. 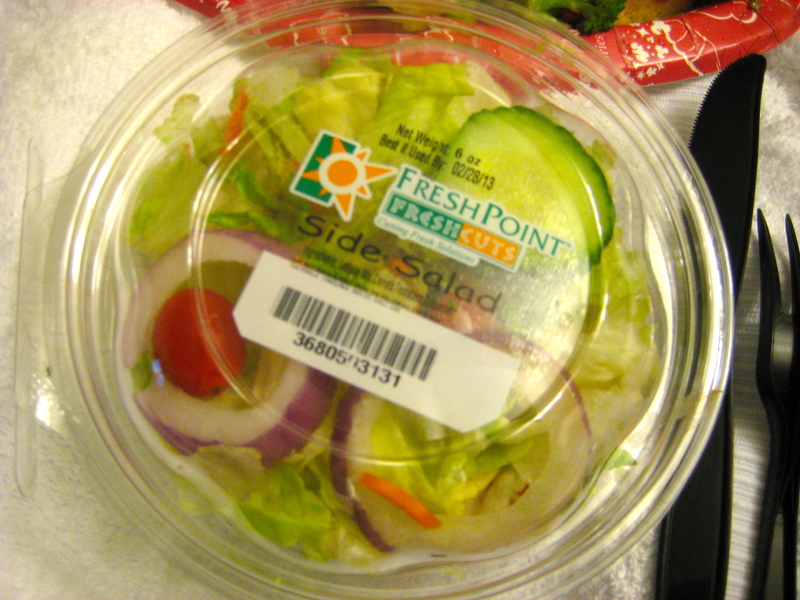 I got a side salad (I contacted the company, these are safe), and a quick fry-up with vegetables and tofu. Sounds boring, probably, but my stomach was still feeling a little queasy and, honestly, I’m good with simple! For Mom, dessert was an Enjoy Life Chocolate Bar, and mine was a Go Raw bar. We did visit another time for breakfast and got versions of the bounty platter. 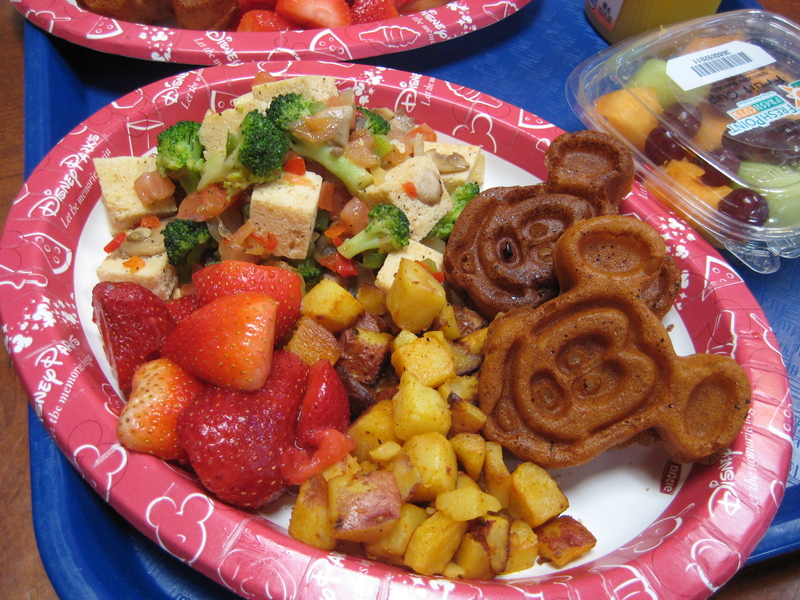 Mine included a tofu scramble that had many of the vegetables that are available in the salad bar, breakfast potatoes, Mickey waffles, and strawberries. We had extra snack credits and got fruit on the side to share (this was our last day). Mom’s was the same, but with bacon instead of the tofu scramble. It was all very good, and I am always a huge fan of breakfast. One of our favourites in Magic Kingdom, we opted for a repeat of what we did last year. Funny: we had the same manager! And so weird… he remembered our order exactly, from one year before. Some version of the salad with a HUGE portion of hummus. At least 1 cup each. Above, that was no to share — that was each! We double checked the hummus to make sure it was safe before ordering. Enjoy Life cookies as dessert, tea for mom (it was SO cold out), and a water to drink (Dasani, unfortunately). 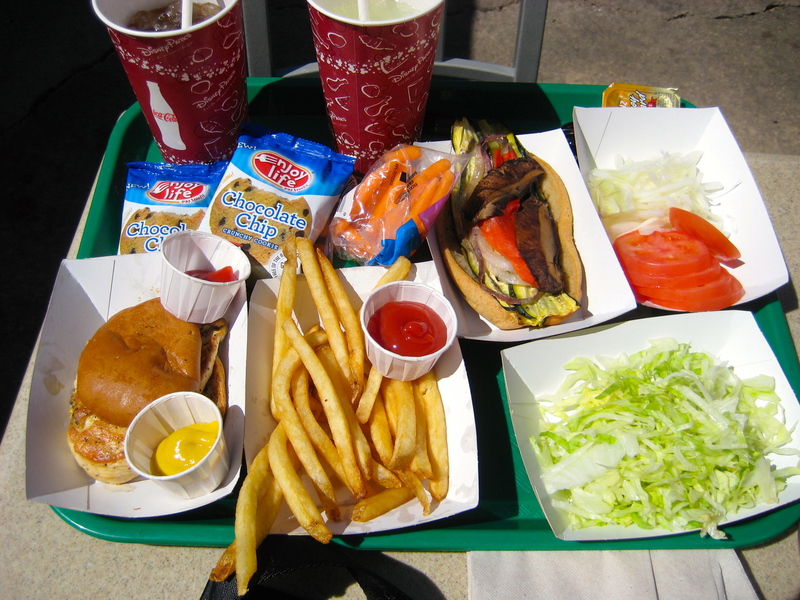 Though this might not seem like the most vegan-friendly place in any of the parks, I actually scored here big time. In fact, it’s one of my favourite places from here forward. 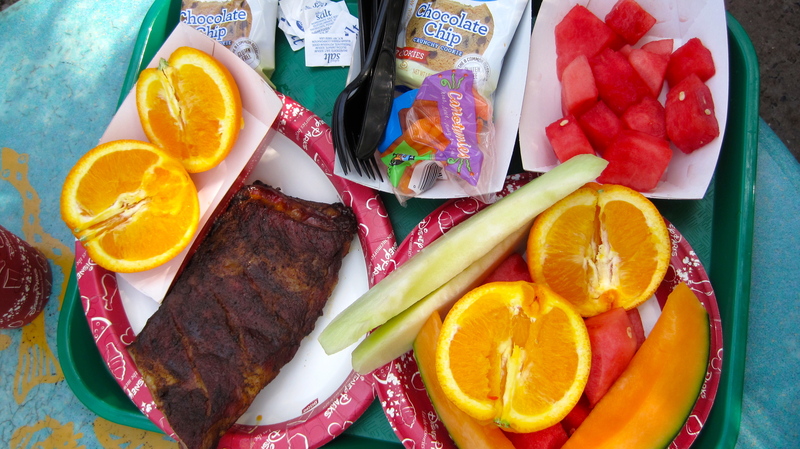 Like past years, mom ordered ribs, but couldn’t have the fries, so opted for fruit on the side. She got a Coke as a treat, and, of course, our default dessert (Enjoy Life Cookies). I had some nuts with me, so I decided to round it out with a modified fruit platter. I talked to her about being super careful with cross contamination, and she made me up a new plate loaded with watermelon, honey dew, cantaloupe, oranges. There were grapes and pineapple available, but I hate no food more in life other than pineapple, and grapes give me hives. I asked her if I could have some baby carrots, too, because I wasn’t getting the yogurt. It might not look like a lot, but it was! Under the oranges was even more watermelon, that orange was huge, and then about 6 slices of the melons. It was lovely, too, because it was really warm out that day so super refreshing. I was going to ask for a GNI bun on the side to be heated instead of the carrots until I saw the amount of fruit, so I went with that. And because she made it for me right there, it was much fresher than the stuff that looked relatively weak in the fridge. We decided to take a detour one day and ate here for lunch, also because we wanted to explore Caribbean Beach to see if we wanted to stay here another time (answer: no). The Chef was actually superbly not accommodating, unlike last year, which goes to show how much of a difference that makes! They didn’t have much to work with (he said, though they have a HUGE menu! 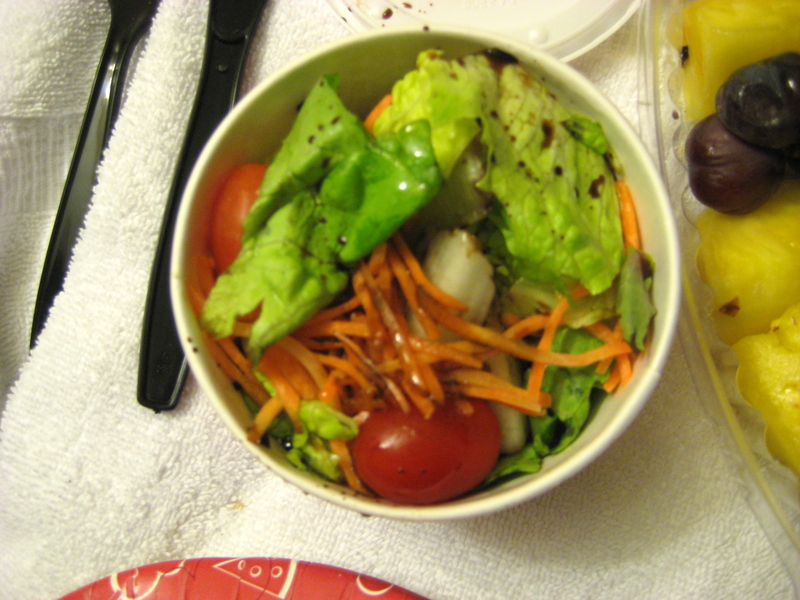 ), so we each got a salad consisting of greens, vegetables, dried papaya, almonds. Chicken for mom, cold unseasoned-right-from-the-box tofu for me (and tasted previously frozen). I suppose I missed a photo of this–I can’t find it–but I promise you… you are not missing out. For our desserts, Mom opted for chips and I was all over the clementines. 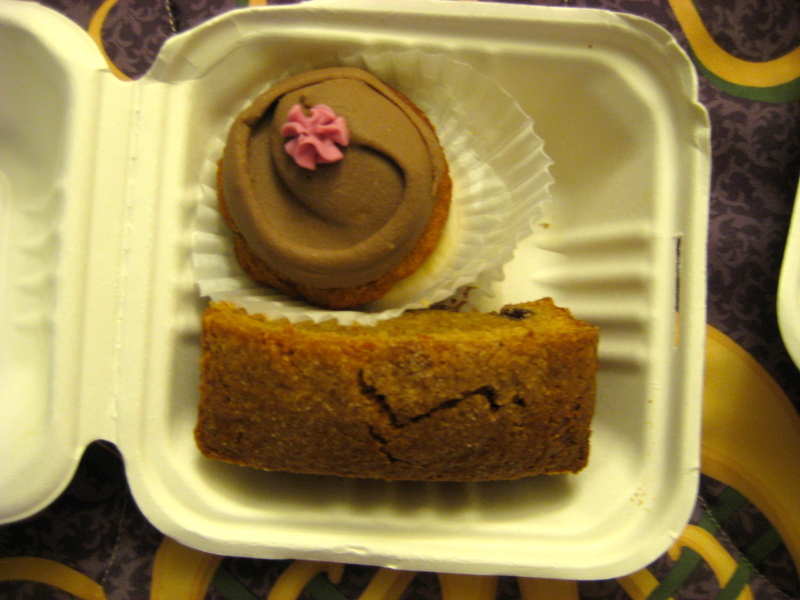 They didn’t have any other allergy desserts (other than the Enjoy Life Cookies) available. 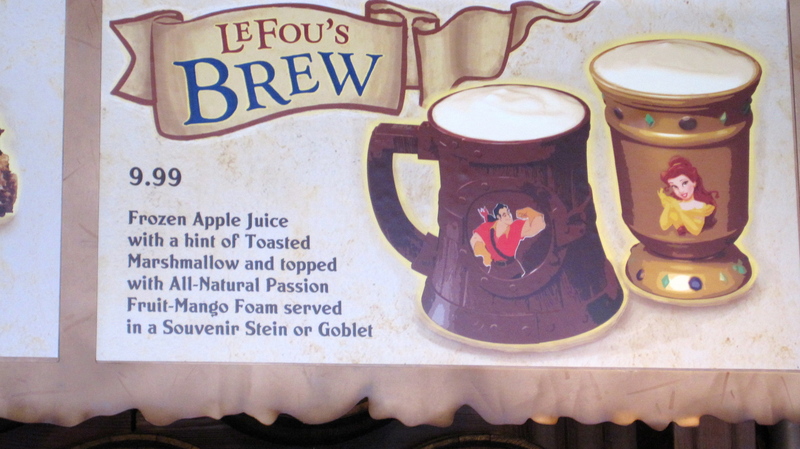 Well, how could I not at least TRY Le Fou’s Brew? Here’s the thing: I know it is apple juice-based, and I know I do NOT like apple juice. At all. But… come on. 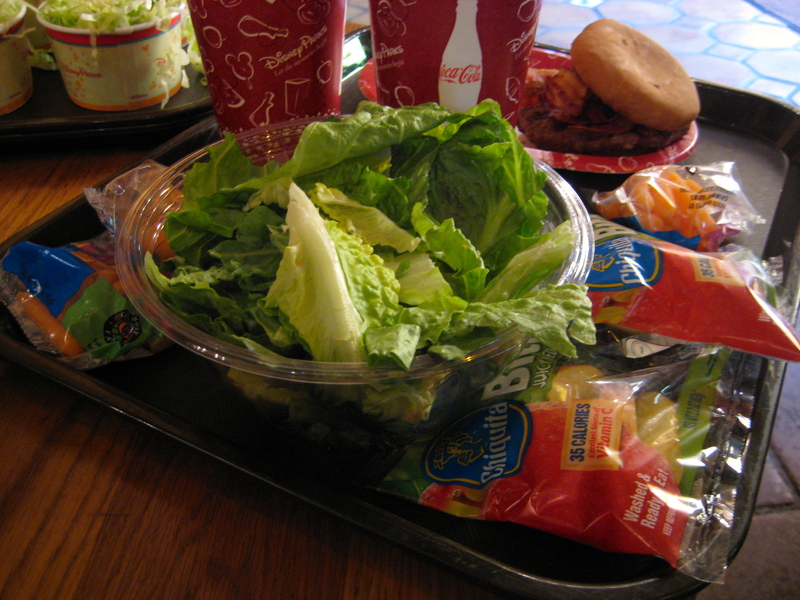 Plus, we had free dining, it was a snack credit, and I seldom use up all my snack credits anyway. I read the ingredients one day, left, called the companies (ingredients were safe), and then tried it. The brew itself is only $9.99 (as stated above) if you get it in the collector’s mug (which, clearly below), I didn’t. It was 8 degrees C that day and drinking it left me FREEZING. If you love apple juice that is amped up with sugar, you’d dig it. It was good for that. It was also a LOT. 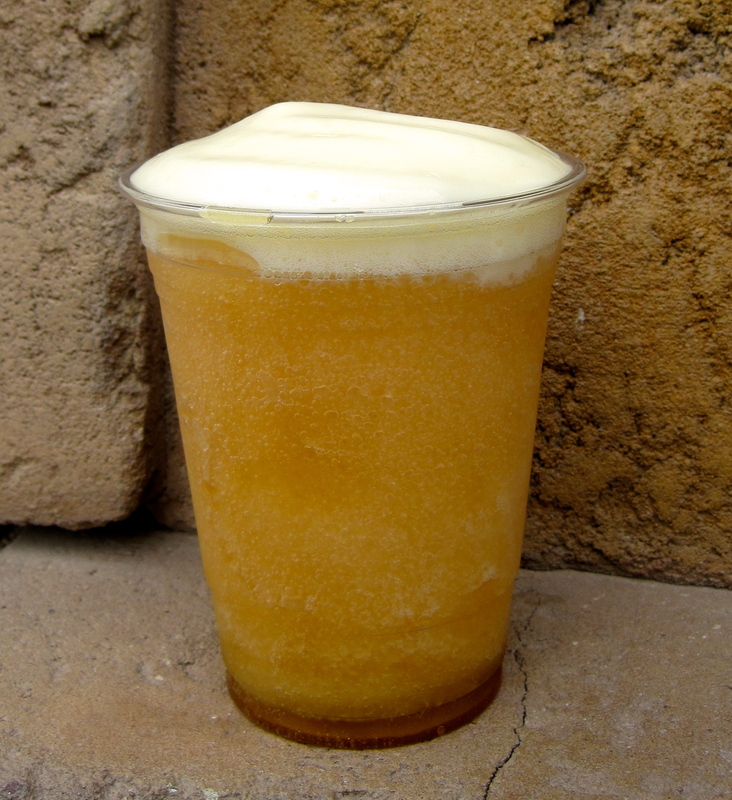 I would maybe suggest splitting it with someone… but maybe that is because it was so, so bitterly cold (and the drink, itself, is slushy-like). So, Sunshine Seasons is a favourite because it has so much to offer. 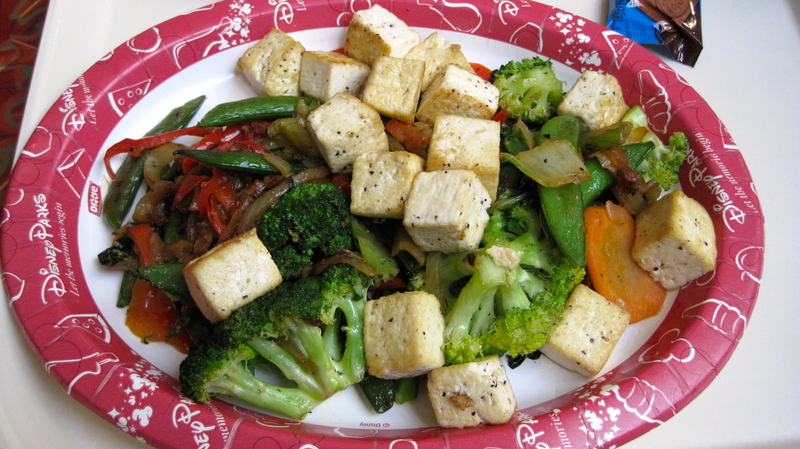 I got the same that I always get here–a stirfry with tofu. 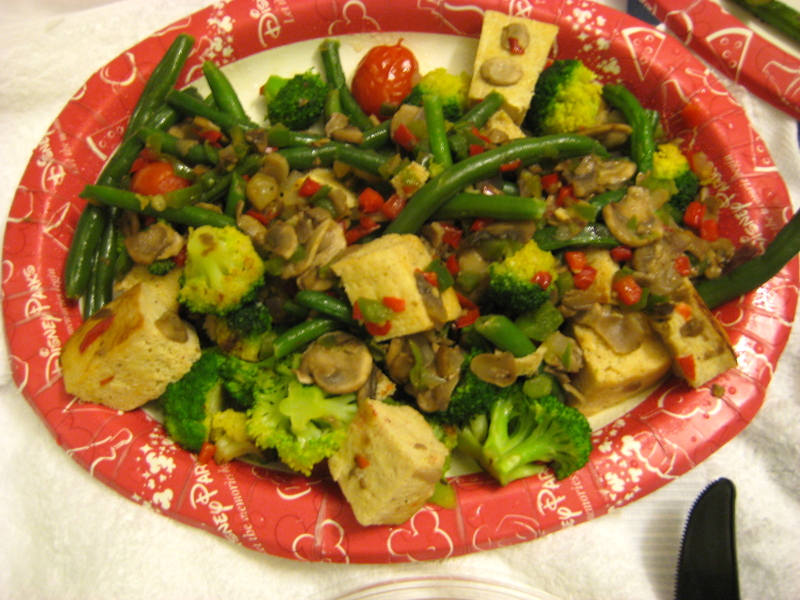 I know they have tofu on hand and fresh vegetables, so it is quick and easy without me asking for much else. 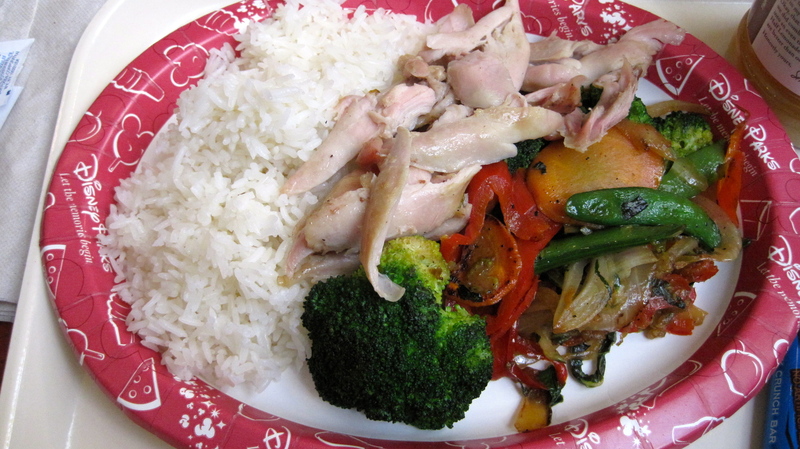 Mom got something similar–chicken with rice and vegetables. Chef Norman is the man who helped us and he was super nice. Here’s the thing: they had tofu on the menu for a vegan (or vegetarian, I’m not sure) dish that isn’t gluten-free, so I asked about the tofu. He said sure, everything is fine. After a few moments, he came back out and said that the tofu was all pre-marinated but “not to worry, we’ll get some from next door”. I said not to worry about it, and he insisted. So I said okay. Five minutes later, he comes back and says that they did NOT have it there, but “not to worry, we know where they have some!” Again, I said not to worry, but again, he insisted. We did wait longer, but we didn’t care (after all, we’re in Disney World and who the heck is impatient on vacation? ), and he ended up getting it. He didn’t have to, of course, but I thought his kindness was important to note! 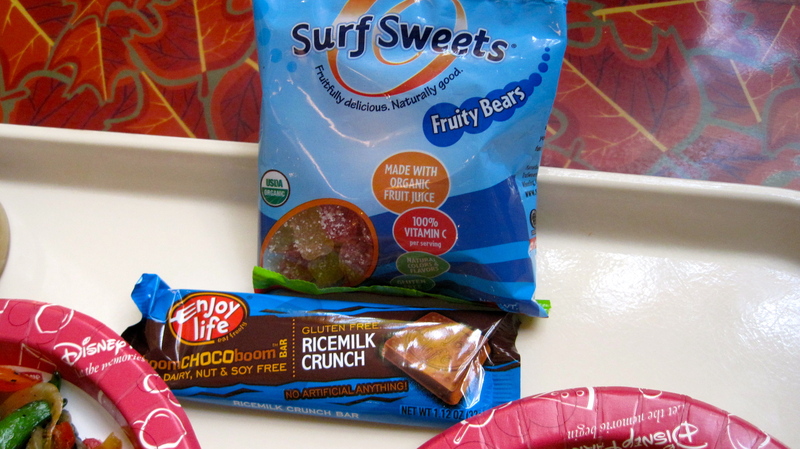 They have a LOAD of allergy Desserts here, and I opted for Surf Sweets while Mom got an Enjoy Life chocolate bar. They also had different Honest Tea options here — including their Half and Half and Peach White Iced Tea (the latter being mine and one of my favourites). Just as an FYI, they also have large boxes of Enjoy Life cookies here for purchase. And Rocky Mountain Caramel popcorn that, by the way, is listed as dairy-free, but I find that questionable. Their site says: “Allergen Statement: Our Caramel popcorn is made with a non-dairy formulation. The natural butter flavoring is butter-derived, but the dairy proteins have been removed. The product is produced in the same manufacturing facility as our dairy flavors.Our dairy and non-dairy flavors are produced in the same facility. We follow standard manufacturing practices, including full wash-downs between runs. Some minor cross-contamination is still possible. This, at the time of the trip, was not written on the bags. We make our own meals here since nothing on the menu is safe as-is. Just like the past years, we opted for corn tortillas with guacamole and tomatoes. Generally, Mom gets chicken, though this year she opted for the beans with me. It was SO cold out, so we got coffee to drink (terrible, terrlble Nescafe… so really, “coffee”), and grapes as our dessert (it was the only option other than cookies). 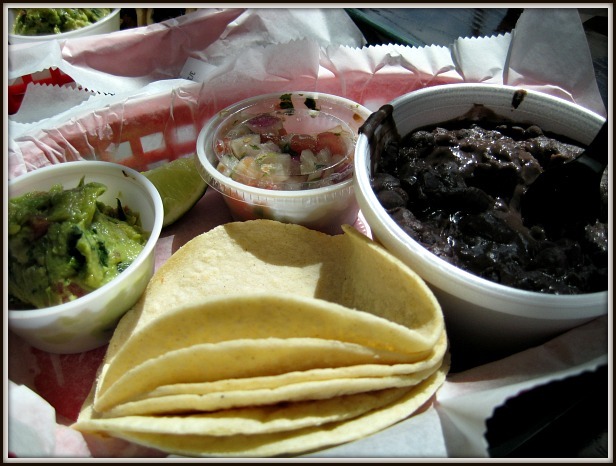 This is 2011’s photo (we ordered the same, minus the pico), so you can see how it was served. I neglected to take a photograph, likely because it was so darn cold out! Wow, what a surprise this was! I heard not-so-great things about Wolfgang Puck’s in Downtown Disney, but that Westside was better. We had a free pass for DisneyQuest, so on the coldest day, we used that. After loads of pinball (Mom), and ages of Bubble Bobble (oh, yes), we decided to find somewhere for lunch. Knowing they were a restaurant, we figured there would be an option. Chef Mike Varda was awesome. He made a HUGE primavera pasta for Mom, and a smoky grilled vegetable plate for me. They had Tinkyada as the gluten-free penne, and loads of very fresh vegetables with delicious grill marks. The gluten-free penne had asparagus, garlic, tomatoes, peppers, zucchini, and sundried tomatoes, tossed in olive oil. My plate had grilled zucchini, peppers, asparagus, rapini, tomatoes, and a side salad of radicchio, greens, tomatoes, romaine and carrots. There was so much food. Then, for dessert, he made us fruit plates with strawberries and melon and fresh mint. All for counter service. I didn’t get any photos–or I can’t find them–but I would venture it might have been because we were so cold. I know I kept saying that, but it was about 6 degrees this day with a huge, huge windchill. You should see photos of us on the trip–shorts, skirts, summer dresses, and winter wear. Quite the mix! 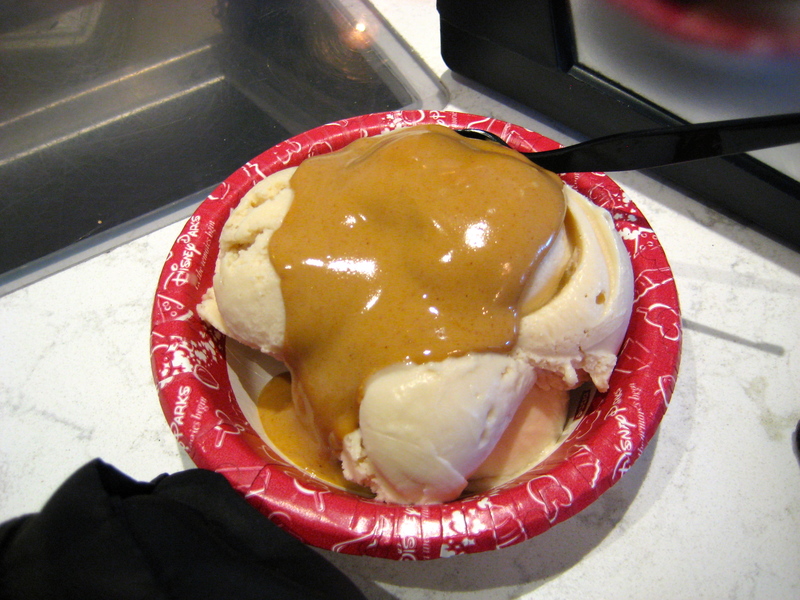 Rice Dream Vanilla (contains soy) plus peanut butter sauce (also contains soy) equals amazing. The end. (PS: Mom got a pineapple Dole Whip. According to the ingredients and Dole, it was changed to dairy-free and the pineapple one was in a dedicated spout. I hate pineapple, though tried a bite (as I LOVE soft serve) and did a non-exaggerated-but-really-happened-full-out-gag-confirming-I-still-hate-pineapple). 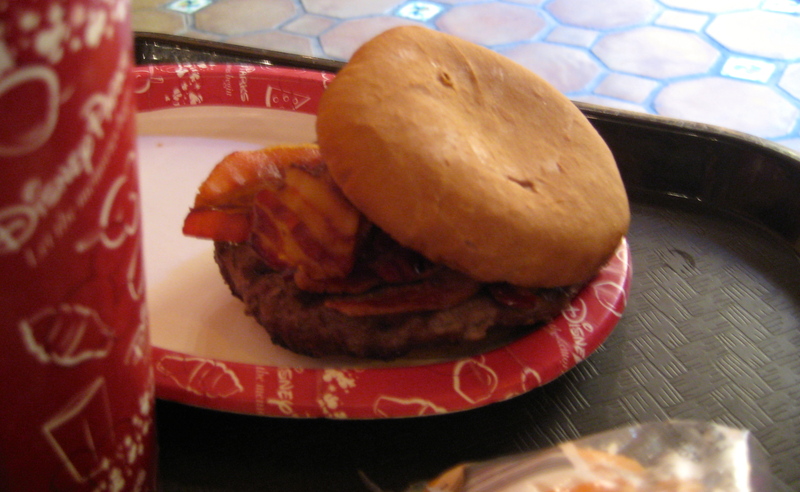 We love Backlot Express because they are always so helpful, but I knew I didn’t want the same thing I always get. Our cashier was Shelly, and the manager was Jose–and one of the best managers ever. Mom had an Angus Bacon Burger with carrots on the side and Enjoy Life Cookies. 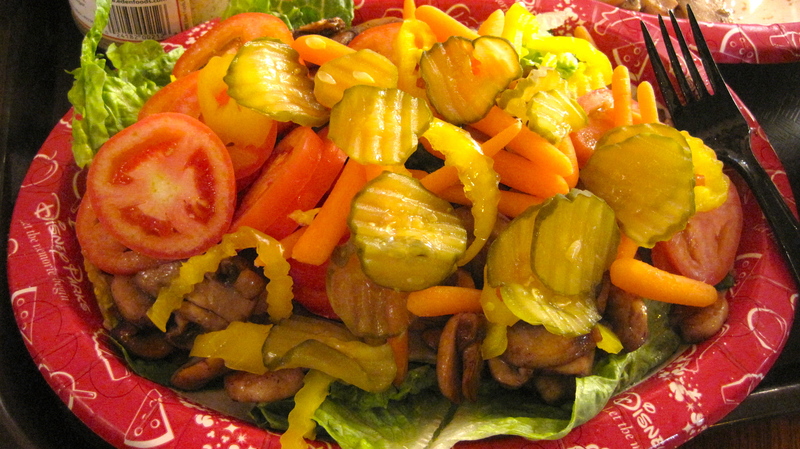 I had the Grilled Veggie Sandwich, which had roasted red peppers, mushrooms, zucchini, tomato, and lettuce. I got applesauce and Enjoy Life Cookies. 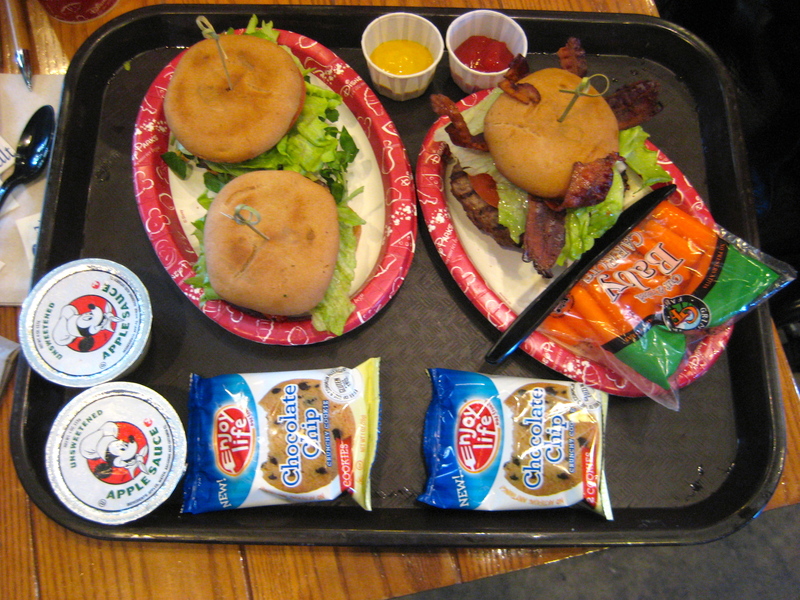 The buns they use are GNI, the meat was just meat (nothing else added), and they did the vegetables elsewhere. If you’re wondering why I have two veggie sandwiches, it’s because he felt one wouldn’t be enough (because there was no meat or veggie burger), which was super kind of him. The carrots and applesauce were in lieu of the fries that generally come with it. They have soy in them so Mom can’t have them, and in general, I don’t love french fries and really need to be in the mood for them. And because Mom loves them, so what kind of daughter would I be noshing down one of her favourites for 15 days? I’m hesitant for Restaurantosaurus, primarily because though I’ve enjoyed their meals in the past, I haven’t always felt the best after. I lead it to an inkling that I think the sweet potato fries might disagree with me, but I’m not sure. That aside, I thought I’d try again anyway. The chef was nice, if not a little frustrated, because I made him show me the box of “those allergy-friendly hot dog buns”. GNI supplied them there, too, but this was after I knew about the pizza crust, and I was just flat-out worried. A lot of folks might give it a wave of their hand, but you likely know I’m super cautious, and just wanted to be safe. Plus, it’s pretty hard to last a day in Disney if you’re not feeling well, especially if you’re helping out someone else. Anyway, it turns out their hot dog roll at the time was GNI, so I opted for that as a sub and was in the mood for fries. I got carrots as my dessert (they had Enjoy Life cookies otherwise). Mom got a grilled chicken burger with no toppings, though we asked for some lettuce and tomato on the side, and the Enjoy Life cookies. Coke for Mom, water for me. Another effort to warm up (you should see what I am wearing in this photo! 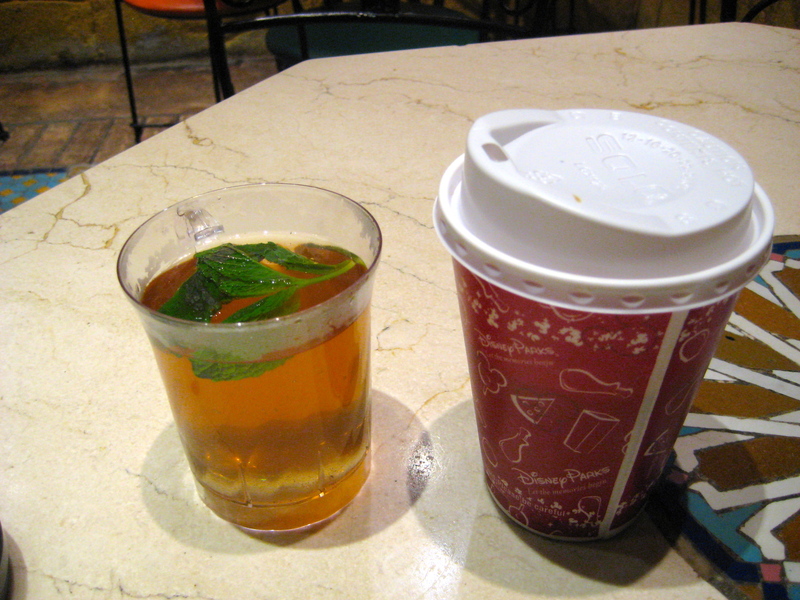 ), we headed toward Morocco, grilled them on the ingredients, and ended up with a Moorish (espresso with nutmeg and cinnamon) for me, and a Moroccan Mint Tea for Mom. The tea had real mint in it – and was really good and fresh – but the espresso tasted super burnt and all the spices were sludged at the bottom of the cup. Maybe that is how Moorish is supposed to taste, but it certainly wasn’t very good. 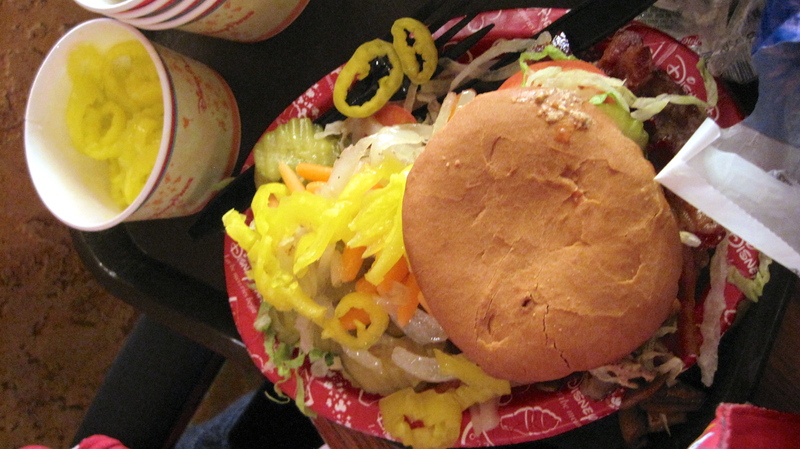 Good ol’ Pecos Bill never disappoints! Especially when we create a meal for ourselves. The manager Art, I think, was a little excited to deliver something fabulous, and this is what we ended up with. 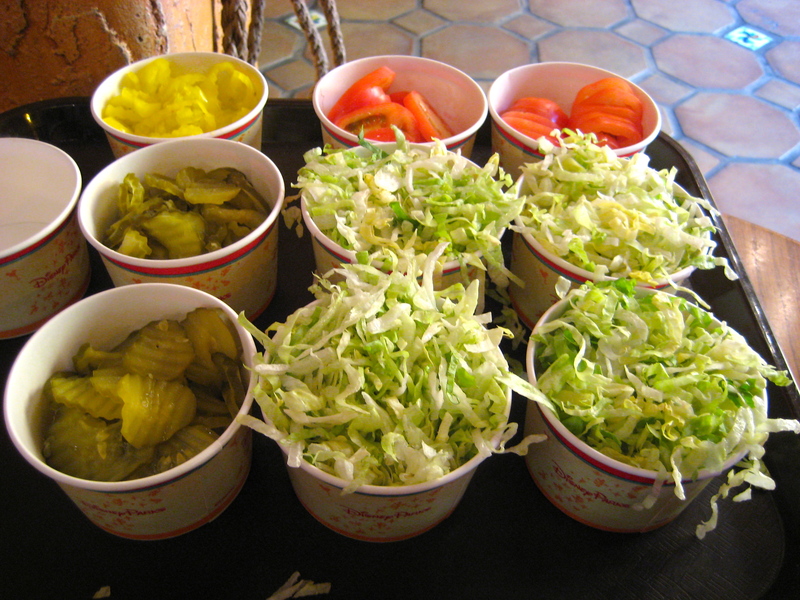 And I decided to put together a salad…. And I dressed it up. I know it looks weird, but sometimes… you do what you have to do. I love their grilled mushrooms, though, and didn’t really need the romaine (especially with all the lettuce he gave), but felt bad about wasting it. 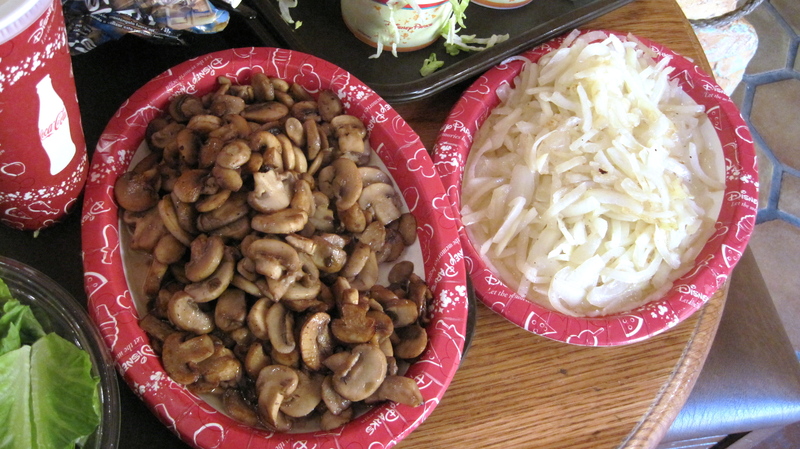 Both the mushrooms and onions are fried in a dedicated area, and he dished out plates for us. Some were for me to have as part of a “meal” I was creating. Some for mom’s burger. 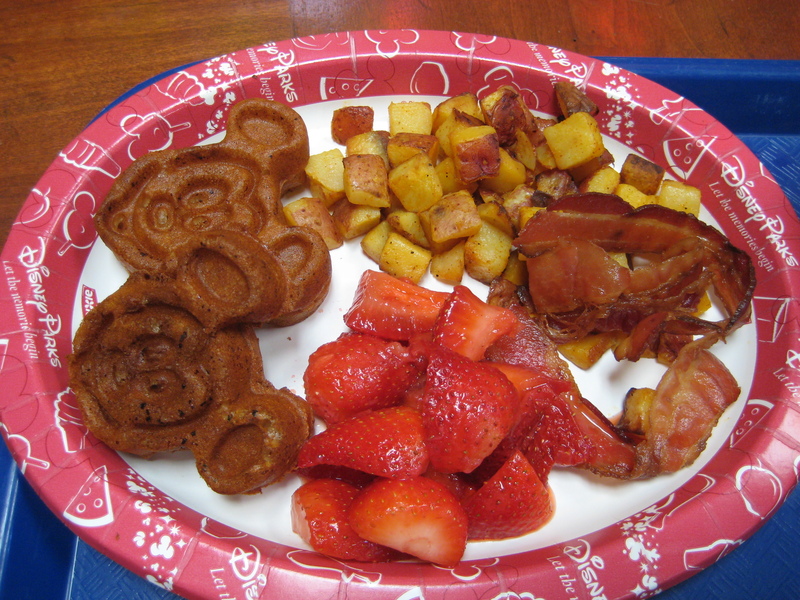 If you’re familiar with the large Disney plates, yeah, those were HEAPING. And then he came back multiple times to check on us. 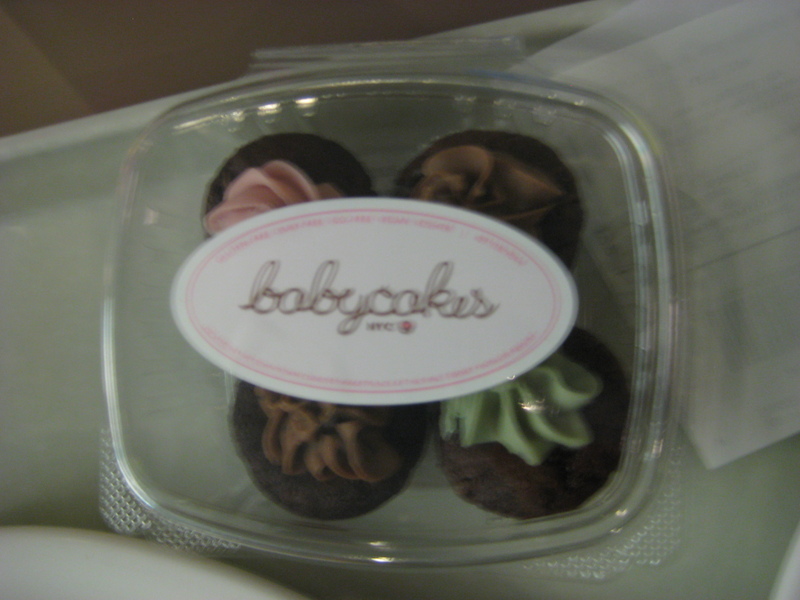 As I mentioned, I’m not a huge Babycakes fan, but mostly just in the way of their cupcakes and doughnuts. I do, however, like their frosting a lot, and their sandwich cookies, so we scored some of these for the plane ride home. And that Cinnamon Toastie.